We're Inspired By Big ideas and small egos. Inspiration. Tricky to define, but you know it when you see it. And make no mistake…you see a lot of it at Hormel Foods. The company’s newly coined purpose statement – Inspired People. Inspired Food.™ – is all about it, and with good reason. Helping workers feel inspired and free to tap into their inspiration is serious business for the global food company. So is understanding that people are unique and thus, inspired in myriad ways. Scott Leathers presents the Pride of the Jersey to Jessica Campbell in 2017. For Jessica Campbell, a 40-something senior customer executive for Hormel Foods, inspiration came as a result of a sudden and serious cardiac episode three years ago that shook her – and those around her – to the core. 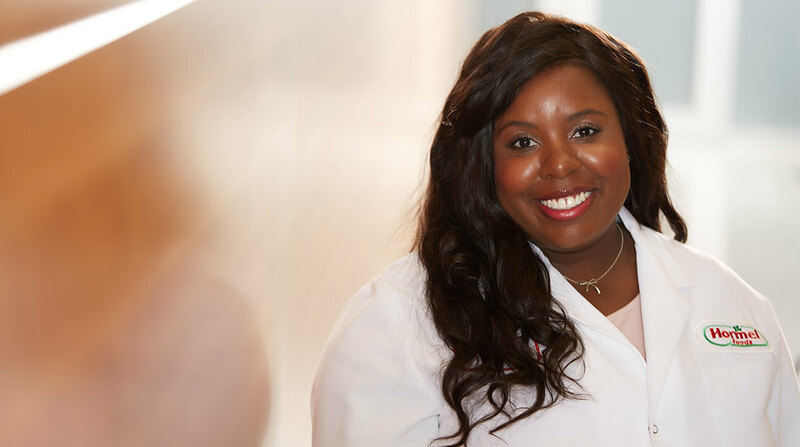 Jessica’s illness took her away from her job for six months of recovery, tests and trips to some of the leading medical centers in the United States. To this day, her heart condition is shrouded in some mystery, but without question, she is more committed than ever to Hormel Foods. Jessica’s story is one that illustrates the relationship between engagement, inspiration and results. 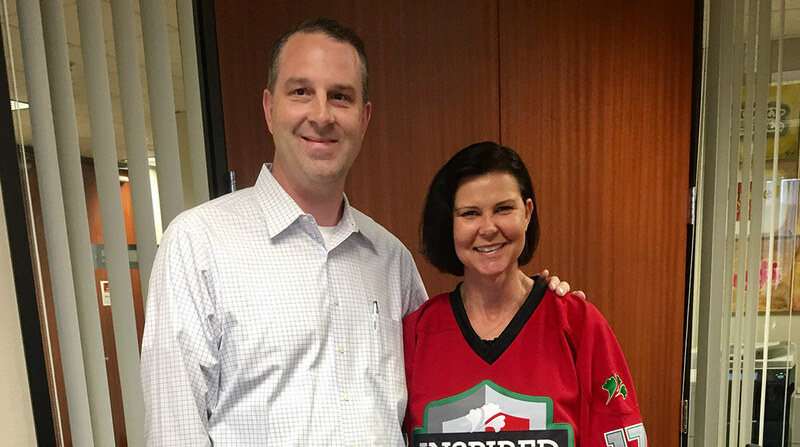 She has continued to succeed and advance in her career, even receiving the Pride of the Jersey award, a team shirt given to employees who embody the company’s values and the Inspired People. Inspired Food.™ mantra. The purpose statement, unveiled in 2017, grew out of the company’s Cultural Beliefs, and a desire on the part of CEO Jim Snee and his leadership team to find a way to give 20,000-plus employees worldwide a common goal. At the same time, they were embracing the challenge of conveying what this large and complex organization is all about, and doing it with just a handful of words. Janet Hogan arrived at the company as the purpose statement was being set in motion. She embraced it wholeheartedly. The new head of HR has a long list of responsibilities, but at the end of the day, she believes reaching across the aisle to make connections with employees is the highest priority. 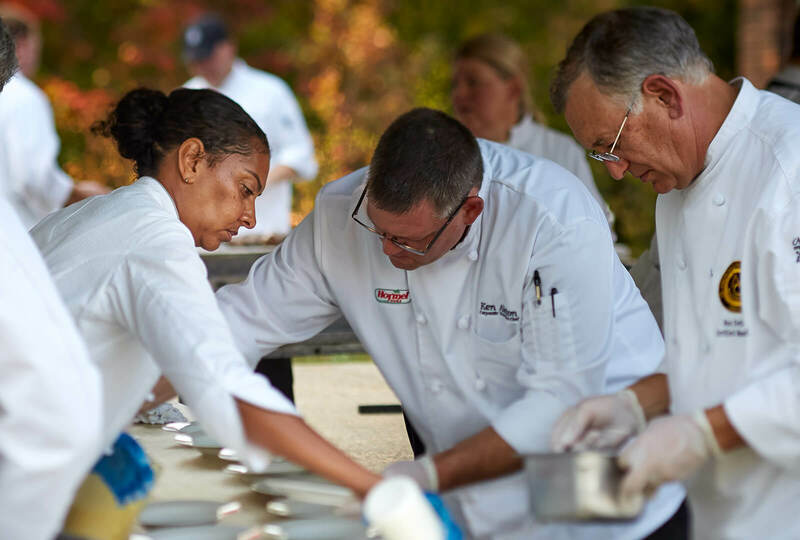 In the simplest of terms, she wants her co-workers in some 70 locations throughout the world to look forward to each day at Hormel Foods and to be inspired enough to make the products that have long set the company apart. “We do so many things right. We care deeply about our people, we have put a focus on inclusion and we have an excellent recruiting process. We have several high-quality development programs in place and have exceptionally strong processes and procedures. The feedback we are gathering will help us identify where we can place our focus over the next several years to better serve our employees,” she says. The gathering of feedback runs the gamut, from casual note cards that line the walls of common areas at the company’s headquarters buildings in Austin, Minnesota, to more formal and structured mechanisms. Either way, the message to employees is clear: We want to know what’s important to you, what will allow you to be inspired to do your best work. Inspired people are also engaged people, highly motivated and invested in the success of the organization. Andre Goodlett leads the diversity and inclusion effort at Hormel Foods. He applauds the new purpose statement for what it does to bolster his life’s work. It’s a perfect marriage, he believes. First and foremost, diversity and inclusion open the door to a path that can lead to inspiration. Put another way, once workers feel accepted and valued, they can engage and be inspired to further the values and goals of their company. Take Yemi Yang, for example, a world traveler from the time she was a child. She recently celebrated her one-year anniversary with the Hormel Foods flagship plant in Austin and is enamored with the diversity of her workplace. Not only does it make Yemi feel at home, the realization led her to pitch in and help establish a diversity and inclusion team at her plant. It’s “about increasing the feeling of inclusivity around different groups of people,” she says.